This blog post is not about Siri and Alexa, it is about oral tradition and digital technology. „The computer is talking to me“ was an expression of surprise by an illiterate Gabra lady starting to work with our eeemBooks for the first time. Imagine, she grew up in a remote rural area in northern Kenya in an oral tradition without written language. She never went to school and learned only by listening to elders. Modern technology like a computer is for her linked to reading, writing and typing – things she never got to know. 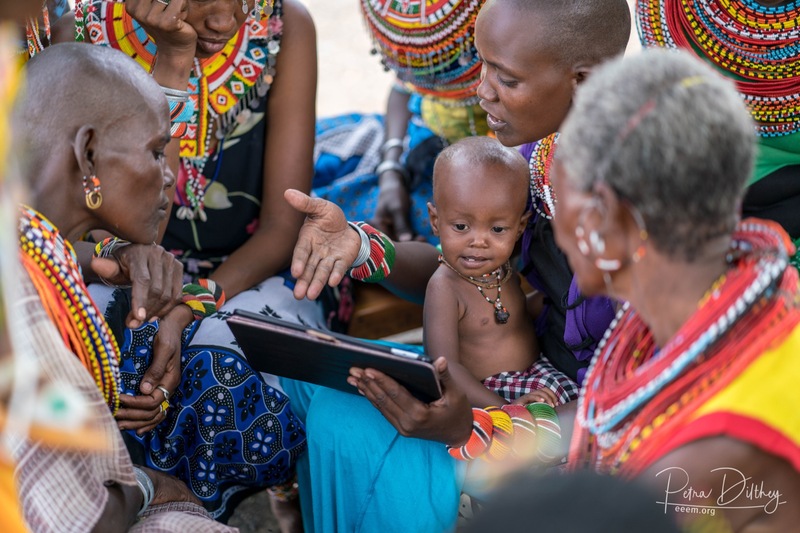 But now this tablet is “talking” to her via videos and interactive audios, that means she can easily relate to this technology. The media creates for her a bridge to work with devices which are so far linked to the powerful government people or wealthy muzungus (white people). Our holistic approach to use multimedia and interactive “talking computers” is much closer and more familiar to the experience of illiterate people in an oral tradition than the formal school system. By appreciating their culture and way of learning it is much easier for them to acquire for example necessary life skills. Is there really still a need to learn in a backward 19th century colonial school setting? Siri, did you get it? 0 responses on "„The computer is talking to me“ (Part I)"